Jon Stewart is considered one of America’s top social and comedic voices. 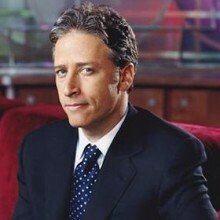 Over the past 10 years, Stewart has redefined political satire in American culture from his perch atop the anchor chair on Comedy Central’s “The Daily Show with Jon Stewart.” In fact, surveys have shown that the overwhelming majority of men and women under the age of 35 list “The Daily Show” as their primary source of television news. As host of “The Daily Show,” Stewart has interviewed such political luminaries as former Presidents Jimmy Carter and Bill Clinton and Senators Hillary Rodham Clinton, Barack Obama, John McCain and John Edwards and such celebrity icons as Tom Cruise, Tom Hanks and George Clooney. To date, Stewart and “The Daily Show” have received 22 Emmy Award nominations and won 11. These include winning for “Outstanding Writing for a Variety, Music or Comedy Program” five times: 2001, 2003, 2004, 2005 and in 2006, as well as “Outstanding Variety, Music or Comedy Series” in 2003, 2004, 2005, 2006, 2007 and 2008. Jon, himself, was nominated for “Outstanding Individual Performance in a Variety or Music Program” in 2002, 2003, 2005, 2006, 2007 and again in 2008 as host of the 80th Annual Academy Awards, which he also hosted in 2006. In 2001, “The Daily Show with Jon Stewart” received the prestigious Peabody Award for excellence in its “Indecision 2000″ campaign coverage and again in 2005 for “Indecision 2004.” The show has also been honored by the Television Critics Association for “Outstanding Achievement in News and Information” in both 2003 and 2005; winning over traditional news shows in the category. In 2005, Comedy Central reached a first-look deal with Stewart’s Busboy Productions. “The Colbert Report,” hosted by Daily Show alum Stephen Colbert, was the first project developed under this agreement and debuted on Comedy Central on October 17th, 2005. Now in its 3rd season, “The Colbert Report” has received 12 Emmy Award nominations. In 2007, the show was honored with a Peabody Award. Stewart is the co-creator and Executive Producer of the series. Stewart has graced the cover of numerous magazines including Newsweek, Rolling Stone, New York Magazine, Entertainment Weekly, GQ, etc. He was also named “Entertainer of the Year” for 2004 by Entertainment Weekly and was honored as “New York Entertainer of the Year” by Variety. Stewart was also named to the inaugural Time 100 list of the world’s most influential people (Time magazine). In 2001 and again in 2002, Stewart served as host of the Grammy Awards. Stewart is also a best-selling author. In 2004, Warner Books published “AMERICA (THE BOOK): A Citizen’s Guide to Democracy Inaction” and it immediately topped The New York Times Best Seller List, staying at #1 for 18 consecutive weeks, ending the year as a top 15 best-seller. It was also ranked #1 on the best-seller lists in The Wall Street Journal, The Los Angeles Times, USA Today and San Francisco Chronicle. Additionally, “America” was given the prestigious book of the year award in 2004 by Publishers Weekly. In addition to this, at the 2005 Grammy awards, both Jon and the Cast of “The Daily Show” were honored with Best Comedy Album, for “AMERICA (THE BOOK): A Citizen’s Guide to Democracy Inaction.” Stewart, his wife and two children reside in the New York Metropolitan area. Do you want to hire John Stewart? Directly request a quote. In 48 hours we can send you the availability of John Stewart If you would like to book John Stewart, Entertainment Booking Agency is the right place. We will offer you the best price and contact the management or we directly contact John Stewart. For corporate appearances or speaking engagements you can contact our agents and the will help you true the process. Tags: hire John Stewart, John Stewart booking, book John Stewart, John Stewart appearances, find more information on booking John Stewart for appearances, John Stewart speaking engagements, John Stewart endorsements/spokesperson, John Stewart appearance fees, John Stewart booking agency contact info, biography of John Stewart, Contact an artist booking talent agent find a speakers bureau that can book John Stewart, speaker booking agency for John Stewart, John Stewart booking agency, John Stewart booking for corporate event. EBA is one of the biggest entertainment booking agencies in the World. We book hundreds of celebrities, artist, athletes and speakers in a year. Important to know is that we are not claiming to be the management of John Stewart. We are not the official agent for John Stewart. Companies from around the globe book these artists and speakers true our company be course we have one of the biggest networks and we always have direct contact with the artist or the management. We help you to find the right celebrities for your corporate of private events. Please contact one of our agents to get free advice and we will help to get the world-famous artist on your party.